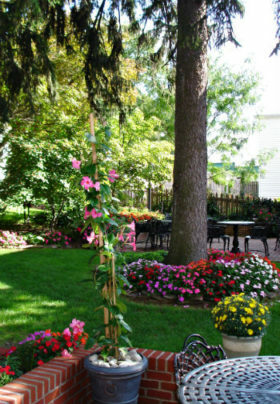 Located in downtown historic Gettysburg, PA, the Brickhouse Inn is a premier award-winning bed and breakfast. The accommodations at the Brickhouse Inn are located in two buildings. The larger of the two buildings (with eight guest rooms), a Victorian mansion, was built in 1898, and has been restored with authentic furnishings. The Welty House, the other building (with six guest rooms) was built in 1838 and was occupied by Confederate soldiers during the Battle of Gettysburg. Our Winter Rates (discounted by $30) apply through April. We can better any rate offered for a specific room by an online travel agency (OTA). All you need to do is call us! We have reached a landmark 1,700 five-star reviews on TripAdvisor! 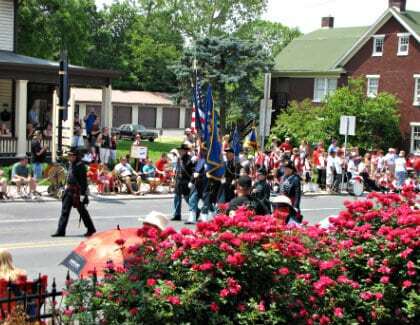 For families, especially with young children, have a look at our six historic Gettysburg vacation rentals. They are separately managed but are all in downtown Gettysburg. Now is a great time to order a Gift Certificate. You can call us, or you can order one on-line (click on the button at the top of this page). We are listed by ‘Business Insider’ as one of 50 Top B&Bs in America. We’ve been awarded TripAdvisor’s 2018 Certificate of Excellence, our 6th year in a row. We have celebrated our 13th Anniversary of owning the Brickhouse Inn. Thanks to all the wonderful guests who have stayed with us, and to our great, loyal staff! 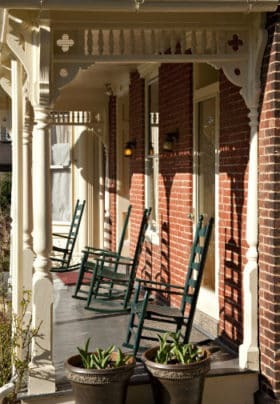 Gettysburg’s premier, award-winning bed & breakfast. Rated one of the top B&Bs in Gettysburg by TripAdvisor for the past six years. Awarded TripAdvisor’s Certificate of Excellence for 2011 – 2018. Choose from two historic buildings: 1838 bullet-scarred Welty House & 1898 Victorian mansion. Ideally located in the downtown historic area. Free off-street parking in rear of buildings. A wide selection of rooms and suites (all with private bathrooms), some with private balcony porches. Modern air-conditioning/heating units in all rooms for individual temperature control. Free Wi-Fi in all the rooms and gardens. Set in beautiful gardens with a koi pond and waterfalls – an oasis in the town. Packages to make your visit easier to plan. The Culp’s Hill section of the battlefield is less than a minute’s walk behind the inn. Two-minute walk to the Soldiers’ Cemetery (where President Lincoln gave the Gettysburg Address). Is the Brickhouse Inn haunted? The simple answer is – we don’t know! We don’t think there’s a resident ghost. Legend says that two or three Confederates were killed in the Welty House. So who knows? If your interest is in ghost stories, check out our packages for evening walking tours and an exclusive driving tour. Welcome to the historic Brickhouse Inn! We’ll make sure you’ll have a memorable stay in Gettysburg. Authentic Victorian portrait photograph! See our new Authentic Victorian photo package – on our packages page! 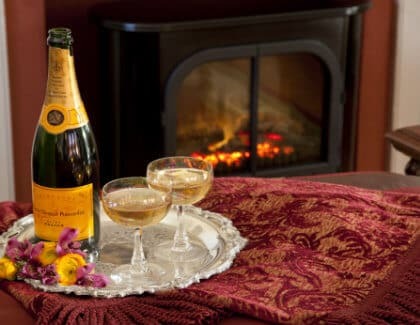 We have a Romance Package ($89) and an Anniversary Package ($110) to add flavor to your lodging! (see the ‘Packages’ page for details}. Guided Historic Walking Tours The licensed town guides of Gettysburg have a variety of walking tours, each lasting for 90 minutes. They include: ‘Walk with Lincoln’ following the footsteps of the President during his November 1863 visit to Gettysburg (every Saturday at 1 p.m. ‘After the storm’: focusing on the experiences of civilians after the two armies left (every Friday at 6.15 p.m.) For further information,contact the Program Director: Joanne Lewis at 717-339-6161. Gift Certificates – There are plenty of good reasons to give a Gift Certificate for a stay at the Brickhouse Inn – a present for that special person, for retirement, anniversary, honeymoon, or a girls’ getaway! Golfing getaway! The Brickhouse Inn is a great base for a golfing getaway. There are a number of good courses within an easy drive of Gettysburg. They vary from manicured (and with correspondingly higher green fees) to slightly less smart (but inexpensive). Brian is an avid golfer and has played many of the local courses. He can make suggestions for you.